Welcome to the obligatory Valentine’s Day post! This soup recipe is not fancy or expensive. It doesn’t have lobster or truffles or oysters or chocolate. And other than the adorable heart-shaped pie crust crackers, it’s entirely unsuitable for an elegant, romantic Valentine’s Day dinner. I made it for Handsome Greg’s lunch, so that he could be embarrassed/warm and fuzzy when he nuked it in front of the dude-bros at the office. Honestly, I think the dude-bros likely had a serious case of lunch envy when Handsome Greg brought in these lovely leftovers. 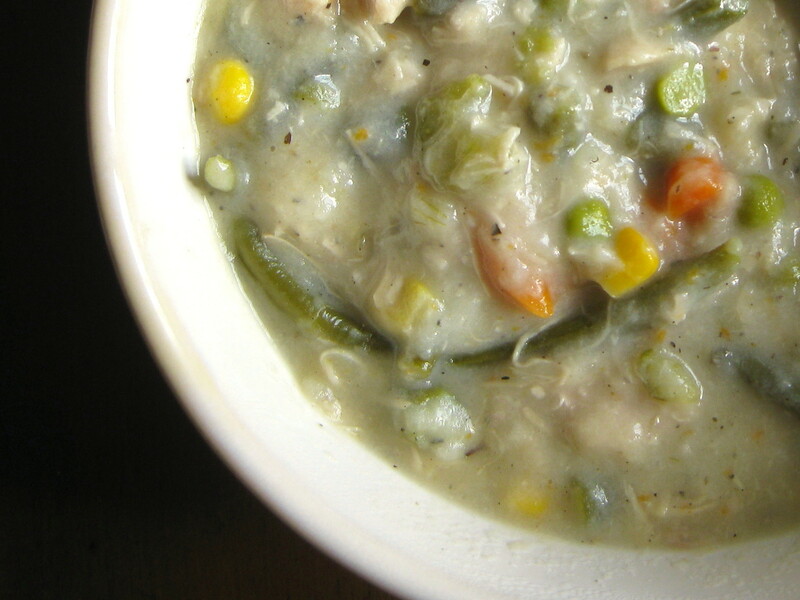 The comfort casserole-turned-soup is rich and creamy, with tender, flaky pie crust crackers. I just want to give it a hug. With my teeth. Enjoy a bowlful of rich, creamy comfort, with flaky pie crust crackers. On a baking sheet fitted with a cooling rack, drizzle and coat the chicken breasts with olive oil. Season with salt and pepper on both sides, and bake uncovered for 35 to 40 minutes, until the chicken is cooked through. Reserve the drippings from the bottom of the pan. When the chicken is cool enough to touch, separate the meat from the skin and bones, chop the meat, and freeze the skin and bones for making stock another day. Add diced potatoes to a large bowl filled with cold water. Set aside. In a large skillet, heat the drippings from the roasted chicken over medium heat. Add the onions and celery and cook until translucent, about 6-7 minutes. Stir in the flour and whisk until it forms a thick paste. Add the Italian seasoning, poultry seasoning, garlic powder, and pepper; cook for 2 more minutes. Whisk the stock into the vegetables and bring it up to a boil. Drain the potatoes. Add the potatoes and the chopped chicken to the broth over low heat. Stir in the frozen vegetables. Cover the pan and simmer until the potatoes are tender, about 15 minutes. Stir in milk and kosher salt and cook for 5 more minutes. Preheat the oven as directed on the pie crust package. 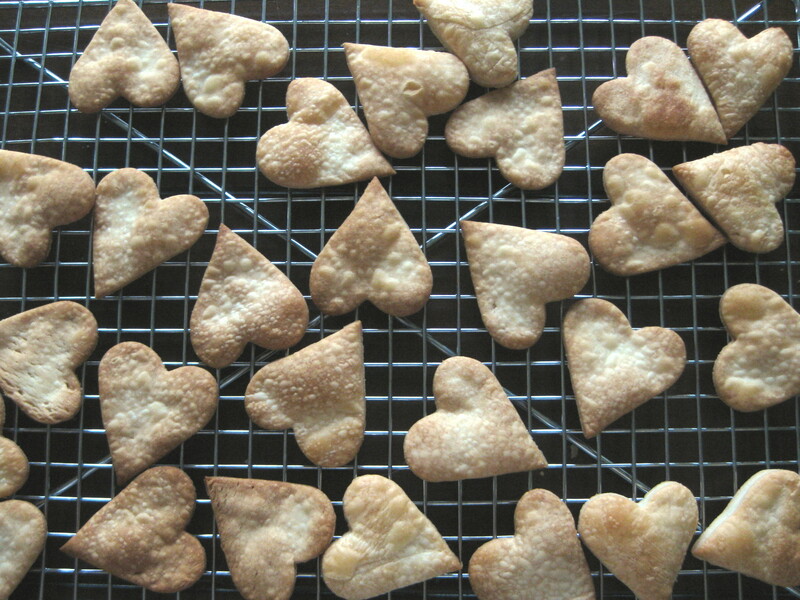 Cut the pie crust into rounds (or hearts!) and place on a baking sheet lined with parchment paper. Bake according to package instructions, shaving off a couple minutes, until the pie crust crackers are golden brown. Ladle the soup into bowls and garnish with the pie crust.